ISLAMABAD, Feb 12 (APP):Women artisans from different parts of the country displayed their handmade art and craft products at women artisans at work festival here Tuesday at the National Institute of Folk and Traditional Heritage (Lok Virsa) in connection with National Women Day celebrations. Besides display of arts and crafts, the day-long colorful cultural activities included performances by female students from different provinces carrying reflection of cultural heritage and traditional attires from different parts of the country and multi-media presentations on women issues. The event was arranged by Lok Virsa, Ministry of Information and Braodcasting, Government of Pakistan in collaboration with Federal Ombudsman Secretariat for Protection against Harassment (FOSPAH) and Potohar Organization for Development Advocacy (PODA). 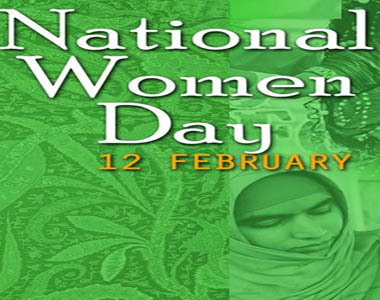 Speaking on the occasion, Kashmala Tariq, Federal Ombudsperson said the National Women’s Day is the celebration of the struggle of women that was started in 1983 when women rights activists took stand and raised voice for their rights. Quoting examples of Hazrat Khadija (R.A) and other women in the history of Islam, she said it is the time that we should not only train our women to stand for their rights but we must teach our men to ensure the protection and rights of women around them. She highlighted the aims, penalties and objectives of FOSPAH and encouraged the young participants of the event to create awareness among others to understand the rights of women. “There is a need for capacity building of women through confidence and harassment at workplace law is for the confidence of women by giving them dignity and respect,” she commented. She asked women to maintain their legacy and help other women for building confidence and come over their insecurities from other women. They should bring positivity in them and get rid of negativity as part of their general training and tell others especially men to respect women. Through live performances, women singers and speakers paid tribute to Human Rights Activist, late Asma Jehangir, legendary singer Reshma and other women for their lifetime services in diverse fields. While elderly women from KPK presented folk tales to revive the culture of storytelling. Lok Virsa has always been in the front row for any initiative that leads to the empowerment of women with special focus on the cultural heritage of Pakistan. National Women’s Day is an opportunity to recognize women’s achievements without regard to divisions, whether national, ethnic, linguistic, cultural, economic or political. It is an occasion for looking back on past struggles and accomplishments and looking ahead to the potential and opportunities that await future generations of women, said the organizers. Craftsperson from Hunza Ambreen displayed her handmade precious and semi precious stones jewelry and caps. “These events are an opportunity to support women and ensure our participation at platforms of national level,” she said. Expert in embroidery from Peshawar, Farkhanda Jabeen said this event will encourage women to reclaim the progressive spaces provided within the culture and use this day as a step forward into this process.